California pizza is known for being wide and flat, with a thin crust, as opposed to the thicker New York slice or the Chicago deep dish. 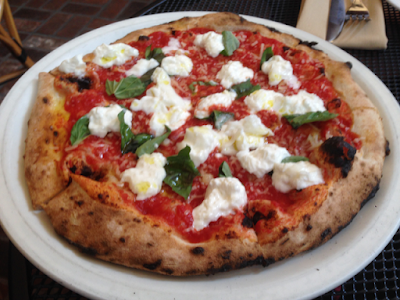 One of the best choices for California-style pizza in the Bay Area is Vesta, a trendy, modern restaurant located in the middle of downtown Redwood City. Featuring a substantial menu of pies and appetizers, Vesta is a great choice if you feel like pizza but want something more upscale than delivery in a box. There are a number of appetizers you could order to compliment your pizza, including the mushroom toast ($12) with sauteed mushrooms on bread or grilled carrots with lemon yogurt ($9), but one item on the menu must not be overlooked: Grilled bread ($2.50). Thick, crusty bread is toasted to perfection and lightly brushed with olive oil, creating a slight bitterness that compliments the sweet-sour flavor of the bread. There’s enough in a serving for at least two people, and it goes well with any pizza you would care to order. Pizzas at Vesta are split into two categories: Red pizzas, which have tomato sauce, and white pizzas, which have cheese. Both types are large enough for two or three people to have a satisfying meal, so it’s highly recommended that you bring someone along. One of the more traditional pizzas in the red section is the basil burrata ($19), which plays on the classic Italian pizza margherita (also available on the menu for $16) by adding creamy dollops of soft, sweet burrata cheese. Fresh basil adds the aromatic punch needed to round out the flavor experience. Other choices in the red section are a vegan pesto pizza ($17) and an interesting pie that has sausage, honey and chili for a sweet-hot flavor ($21). My choice in the white section is the Rosemary Potato & Bacon pizza ($21). Though unthinkable as a topping on a conventional pizza, the potato is one of the stars of the dish. The texture of the German butterball potato provides a palate contrast to the crisp bacon and soft cheese and the flavor combines beautifully with the dash of rosemary sprinkled across it. The pizza combines the casual delight that normally comes with eating pizza and the comfort of a home-cooked meal, providing an eating experience unique to Vesta. After such great options for pizzas, it almost seems unfair that Vesta’s desserts are considerably above-par. Ordering a generous scoop of gelato ($5 with add-ons) is an excellent choice; my personal favorite flavor is the salted dulce de leche, which has coarse rock salt added to provide new flavors in every bite. Make sure to pay a little extra to add warm Tcho chocolate sauce, especially on a cold winter’s day. If ice cream isn’t your thing, you might want to order the Mexican chocolate bread pudding ($7), which comes with Grand Marnier sauce. Vesta is a member of the newest generation of restaurants, which uses interesting local ingredients to put a spin on the classic American comfort food dishes from decades past (See also my review of Smithfield’s in Ashland, which offers a similar experience.) It provides a refined meal experience while removing much of the pretension of older fine dining locations. This mix of casual and sophisticated, along with its prime location near some of the Bay Area’s best theatre, makes it an excellent choice for the theatregoer.